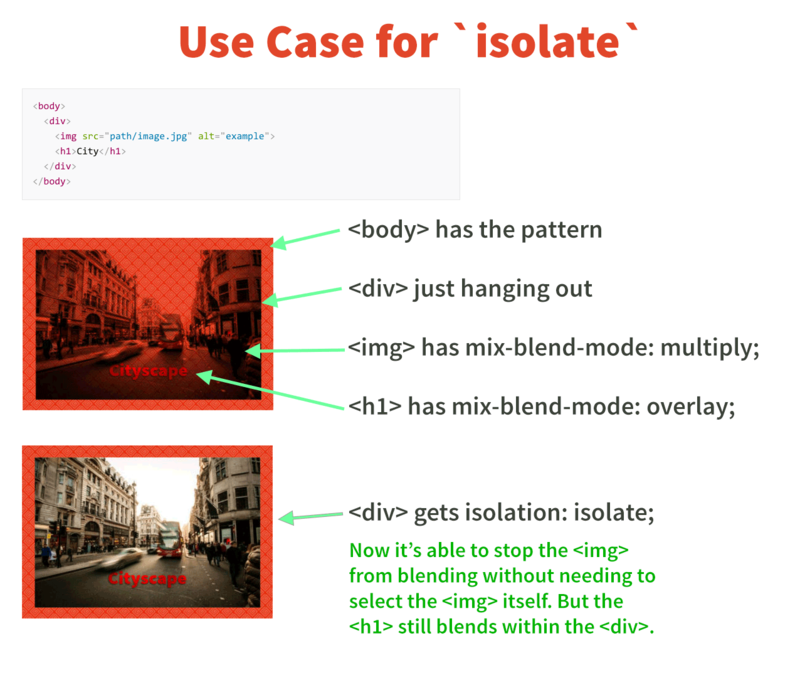 The isolation property in CSS is used to prevent elements from blending with their backdrops. It is most commonly used when mix-blend-mode has been declared on another element. Applying isolation to the element guards that element so that it does not inherit the mix-blend-mode applied to the other elements that might be behind it. In other words, if mix-blend-mode is telling overlapping elements to blend with one another, then isolation creates an exemption on the elements where it's applied. It's like a way to turn off mix-blend-mode, but from a parent element rather than needing to select the element with blending directly. isolate: Does exactly what it says. It protects the element from blending into other elements that are in the backdrop. auto: Resets the isolation and allows the element to blend into its backdrop. See the Pen Isolation Cha-Cha-Cha by CSS-Tricks (@css-tricks) on CodePen. See the Pen Text/Image blend with mix-blend-mode by SitePoint (@SitePoint) on CodePen. You might expect isolation to isolate elements when background-blend-mode is used, but that's not the case. Background elements are already isolated by their nature in that they do not blend with the content that is behind them. The use of translate appears to isolate the element on its own without the use isolation. Wondering how can we use this property to disable opacity on some specific children. For example a given opacity: 0.1 to a div inside of this markup div > span*2 and disable one of those span from being transparent. Even a rotated parent using transform: rotate(), or so many more examples. I just could see this in action for mix-blend-mode property, not anything else which is creating another stack-context. Is isolation property able to do these stuff? FYI commenting out the isolation rule in the pen doesn’t do anything for me currently in chrome, may be a CodePen bug. Ii got it to work by placing the background image of the body on a new div surrounding the rest of the HTML.